My thoughts go out to the victims, their families, Orlando and the LGBTQIA community. I finally followed through on my promise to put this set of plants under the Aerogarden's light hood. It really has grown over the span of a few days too. I first put them under the light hood on the eighth of June. Three days later, they were all growing tall and dark green. Their rate of growth also increased significantly. This is what they're going to look like once they're fully grown. I recently got the news that my father died. Life has been pretty hectic since and I've been pulled into the nexus of responsibility with regard to the funeral arrangements. I'm still trying to figure out how to handle this. I'm the youngest of six. I never thought I'd have this on my plate but I'm accepting it as my own because it's the right thing to do. Anyway, to the plants. They're not growing much due to the near constant shadow of clouds covering the Maryland area but they're doing alright considering there has been constant rain and almost no sunlight over the past few weeks. If things don't get better by the end of this week, I'm dedicated to breaking my word and putting them under the light hood of the Aerogarden to give them all a boost until the sunlight returns. Today, I got my seeds in the mail. Most of these seeds will be grown in the garden once I eventually get it. I'm keeping them in a cool, dark place until they're needed. The only thing that didn't come, due to being back ordered, were the cucumber seeds. I don't know how big that package will be. I've never really noticed the size of cucumber seeds before. So, I don't know if I'm getting a little pouch or a big sack of seeds but the quantity will be 1,000 seeds. Regardless, I'm looking forward to growing them along with everything else. This is where my crazy plan comes into play. It's completely loony. Then again, so am I. I'm going to restart the back patio garden with the hopes that, this time, it'll grow something meaningful. This will require me to invest in some patio furniture so that the management doesn't clear my garden out this time but, I'm hoping anyway, that the extra money spent will be worth it in peppers, basil and tomatoes. I'll also be growing some in my room, utilizing the grow light of the Aerogarden of Serendipity. Forty-five watts is a lot of brightness to have shining only on an herb garden. I'm hoping that some of the excess light might aid the growth of a few plants in pots. I'm going to be very cautious and ensure that there are no little critters making a home in the soil I use. To that end, I refuse to buy the Potting Mix That Must Not Be Named due to their perennial issue with Fungus Gnats. I'm going to try Pro-Mix instead and hope for the best. The Aerogarden of Hope (as I've taken to calling it) has finally experienced a 100% germination rate. The Curly parsley is just visible in the middle front pod. Everything is now growing like crazy. Yay! On the soil baby side of things, I've snapped all the old leaves off of my scented pelargoniums in an effort to make them shoot off more side branches before Mid-June. A few of them already have good side branches with signs of flowers but I'm hoping for really bushy plants. Still no signs of life in the seed experiments. I've got until next month for the end of it to come but some sign of life would be nice. Especially in the Cinnamon Basil. I'm honestly not expecting the celery to grow. The Cinnamon basil, on the other hand, has surprised me quite a bit in the past. I'm hoping for one more surprise for old time's sake. So, I also cut back my Lemongrass this morning and made tea with the clippings and one of the stalks. It was so delicious! I highly recommend growing lemongrass even if you only use it to make tea. It really does taste like lemonade or lemons or something lemon-y. Even the Maternal Parental loved it when she tried it and she likes nothing natural. She specifically begged me to give her another cup as soon as the lemongrass has grown out again. I'll do my best to keep that promise. The African Violets are okay...I think. The plants look fine. I just watered them for the first time in a week. However, I'm not sure how the cuttings are doing. I don't have X-Ray vision to see into the potting mix they're sitting in to know whether or not their roots have taken. They still look alive though. So, I'm hopeful. The Pineapples look fantastic. I give them a spritz of water from my spray bottle every morning to ensure they don't dry out. Other than that, I water the soil about once a week. They were dry today, so I watered them a bit along with all the other plants. The Aloes, Spider Plant, Nasturtiums, and Snake plant are all doing well too. The orange trees look so good, I'm considering experimenting with making tea out of the leaves. The Tangelo is growing strong too. The seed pods in my Aerogarden are sprouting like you wouldn't believe. After only two days, there are signs of life in some of the pods despite a sprouting estimate of four days to eight days minimum. In a day or two, the grow domes will be ready to come off of the basil. The other seeds are still in the process of sprouting. All my plants that I previously meticulously watered/fertilized every other day depending on the week have been going without. They're thriving. The Orange trees are growing new branches. While the Aloe Vera is deepening in color and contrast. The African violets are perking up quite nicely and the scented Pelargoniums are branching off. Everything is doing fantastic. I've even planted ancient seeds I've had for a minimum of five and a maximum of twelve years. 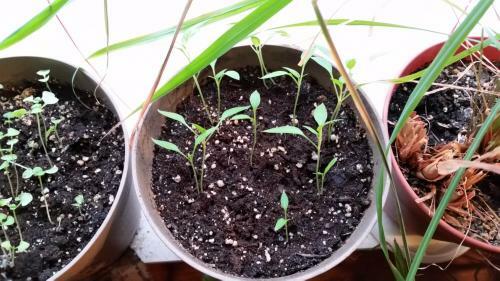 In the case of the five year old seeds, I sprinkled some celery seed I have as seasoning into some potting soil, somewhat lightly covered it, watered it and hoped for the best. In the case of the twelve year old seeds, it gets a little more complicated. Back in 2003, I bought some seeds from Seeds of Change. Specifically, I bought Cinnamon Basil seeds and grew them to maturity. Man, did they ever grow too! When I lived in the crackhouse, I had a SSE facing window and got ALL THE SUNLIGHT!!!! This meant that a lot of plants did very well in my room, when I didn't eat them. One of the plants that did incredibly well was the Cinnamon basil. I must have sowed that Basil into every pot I had. It grew up to twenty four inches tall in most pots before setting seed. I had so much seed, that I was going to send some to my friends but, being poor, I didn't have the means to ship it all. Fast forward to a few days ago when I was cleaning out my sorely neglected computer desk. I came across a folded and stapled bit of tissue paper which contained some of those seeds I'd collected. At first, I was going to throw them away but then I thought about it. They should be given the chance to grow just like any other seed. So, I planted them in a four inch pot of soil. It must have been about twenty or thirty seeds in the packet. After all this time, I'm highly doubtful of anything coming up but...you never know. I now know what I've been doing wrong with my pelargoniums! Eureka!!!!!! My silly behind has been giving them fertilizer every two weeks along with the rest of my plants. Well, that stops today. Hopefully, enough time will elapse between now and the expected blooming season for flowers to finally appear on my babies. On top of this, I'm going to look around to see how many other plants I can get to bloom if I take a break from fertilizing for the Summer and Winter. Incidentally, I've finally planted the Pineapple babies in pots around six this morning. They're relaxing on my sewing table, soaking up the carefully applied water I gave them. According to this page, I must lay off all my regular activities. They're the ultimate low maintenance plant. Hopefully, I don't kill any of them. I'm not hopeful of growing an actual pineapple but you never know. I just appreciate the beauty of the plant itself. So, for the pineapples, I have my spray bottle at the ready. There should be enough fertilizer in the soil for root feedings which I will supplement occasionally with foliar feedings. For the Pelargoniums, NO FERTILIZER except ONCE A MONTH. Poor things need to go on a serious diet. For everything else, research research research. Here goes nothing but my hopes and dreams. I've re-potted my withering African Violet to give it another chance at growing. I think the soil became too compacted and mineral rich for its root structure. For the most part, it hasn't grown much but it is holding on to life, poor thing. In addition to this, I've also planted the African Violet leaf cuttings I've had sitting in water for a little under three week's time. Here's hoping that they'll grow this time. None of the leaves are anything like what the suggestions said they should be. They're scarred and brown in some places and from parts of the plant not recommended to propagate from. Yet, when I did follow the directions, my cuttings all died on me. So, I figured I'd break the rules. 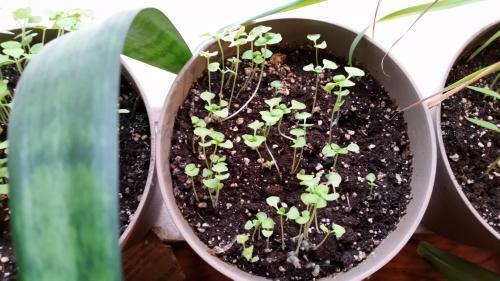 I've also planted nine Nasturtium seeds in various pots around my room. They're old seeds from my last big seed purchase, so I'm not expecting much even if I am hoping. If they do grow with the new watering schedule and lighting I have in my room, I'll be very happy indeed. The Tangelo looks like poop. I had it under a clear cup for humidity and now it's getting used to the dry air of my room. Well, we've all got to grow up sometime. The pineapples look fantastic...and fantastically small. 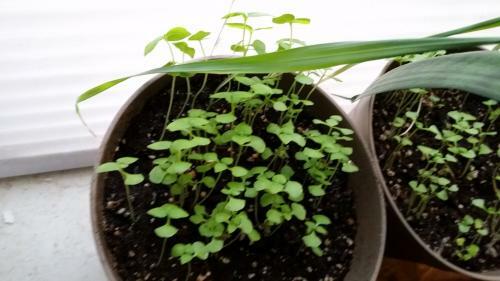 I have them growing in an inch and a half of soil along with the newly planted nasturtiums. All of this is covered by a top to prevent moisture escaping. Once the nasturtiums start growing, I'm taking the cover off, come what may. It's time for the pineapple babies to be weaned as well. The Pelargoniums look excellent. I really hope they flower this year. I have both cuttings and seed grown plants from last year that didn't bloom. I'm going to experiment with the watering schedule to see if I can get them to do something other than grow the gorgeous scented leaves they've been growing up to this point. My Orange trees have been growing in an interesting manner. I've begun the process of turning them into Bonsai trees. I snipped a few suckers off and waited for the new ones to come in where I like. So far, they're both doing well considering I hacked off sizable branches from both. I still have a ways to go before I'm completed but I figured I'd give them a chance to force out new branches before I get cut happy again. The Aloe Vera, both my cousin's held plants and my own are doing well. My cousin's plants I rooted for her are doing so well, I don't know what to do with them. They're getting so big now that I'm running out of room for them in their present locations. I'm going to get a nice big pot for them and sink them into some fresh soil. I have confidence that they'll take. The coleus, due to lack of space, is still sitting in water but even those are shooting up like crazy. I'm going to clip them a bit tomorrow to encourage their branching out. The Lemongrass...wow! I had no idea it would get so out of control when I grew those seeds. Initially, it only grew a small amount before dying back. I never thought it would get much bigger than that inital growth. I'm glad to have been wrong though. While it's not growing straight up, it's almost as long as I am tall. It's presently draping itself over other plants and trying to grow through the shades on my windows again this year. I think I need a bigger pot for it all. The Snake plant is growing well, as are the satellite Snake plants downstairs. I still have those water rooted cuttings in the medicine bottle and they all still seem to be alive. Last but not least, coming full circle, the other African Violet plant. 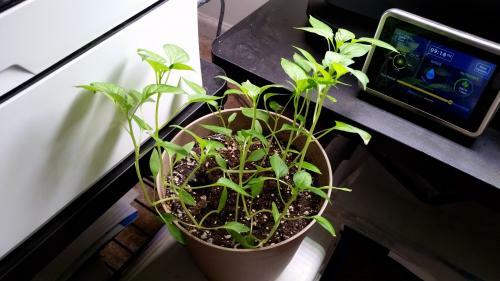 It's thriving despite the loss of several of its leaves in growth experiments. I'm hoping it will bloom again this year and put on an even heavier amount of growth than it already has. Having nothing else better to do aside from knitting and crocheting, I decided to plant some Mesclun greens seeds I had left over from Spring 2010 in a 4 inch container. Yes, I'm a rebel. In the mixture of seeds are Lettuces Black Seeded Simpson, Red Salad Bowl, Lollo Rossa and Royal Oak Leaf. Along with these are Arugula Rocket and Radicchio Red Verona. Shocking! Something is growing from the soil already and I just planted it on the 20th. Yesterday was unusual in that I fertilized my plants. It's the first feeding of the year. I figured, the Sun is shining on them for longer periods of time, they're going to need something to draw on if they're going to grow to their full potentials. I fertilized everything except for the plants downstairs, the plants in the bathroom and the pineapple/Minneola tangelo seed potential. Yes, it's much earlier than I'd intended on fertilizing but, with the way they're all shooting up, I figured they were all early growers/bloomers. The Saintpaulia leaves I propagated a few days ago are holding up well in the makeshift greenhouse I've created for them. Well done me. I'm hoping that, within two month's time, I'll have some new babies to separate. By then, I should have several more. I'm quite addicted to African Violets now. Even the pink ones have their appeal and I find the color pink to be hideous in most other circumstances. You'd certainly never catch me wearing it but you might catch me buying a ruffled pink Saintpaulia plant.